In an animation studio, you will generally have several people using Harmony who will probably be assigned different tasks such as Ink and paint or compositing. You should normally create a different user for each one of them. 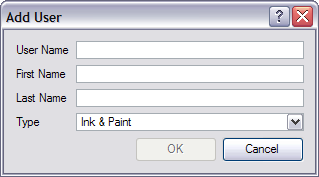 This way, the person assigned to ink and paint will only access the Paint module and not to other functions that are not relevant to his work. Everyone who uses Harmony must have a login name in order to run any of the modules. The Harmony login is independent from the computer session login. 1. In the top menu, select Admin > Users. 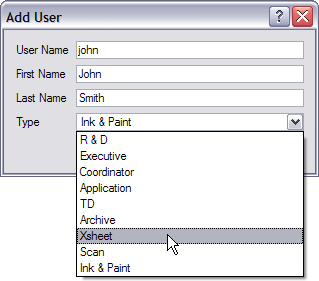 The User List dialog box appears and displays your login name and a list of the other users in the system. 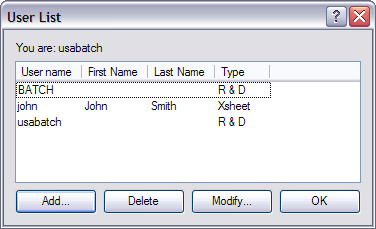 By default, only the usabatch and BATCH users are created. You should not use those for your staff. These should be kept for the Toon Boom Harmony Server when performing background operations such as the batch processing. 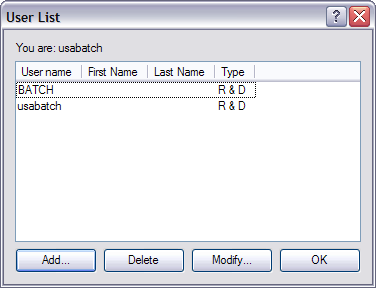 The User List dialog box lists all the users and their details, including; username, first and last names, and user type. The buttons at the bottom of the dialog box let you add, delete or modify the list of users. 1. To view the list of Harmony users, select Admin > Users. 3. In the User Name field, type the person's user name. Make sure that the user name does not exceed the 12-character limit. 4. Type the person's first name and last name in the corresponding First Name and Last Name fields. You can enter a space if you want leave the field blank. 5. 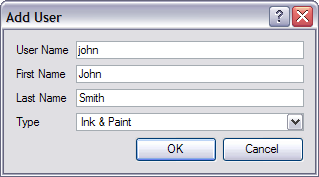 In the Type drop-down menu, select the user type. This defines the type of work the user typically performs. It will allow or block the person to access certain Harmony applications and perform operations in Control Center. 6. Click OK to complete the user creation process or click Cancel to abort it. The Add User dialog box disappears and the name appears in alphabetical order in the user list. • R&D: The user is a part of the Research and Development department. No restrictions. • Executive: The user is an executive producer in the studio. No restrictions. • Coordinator: The user is a project coordinator in the studio. No restrictions. • TD: The user is a technical director. No restrictions. • Xsheet: This user type is used for the Xsheet team, animators and compositors. Access to all Harmony applications. • Scan: ONLY has access to the Scan, Play and Paint modules. • Ink & Paint: ONLY has access to the Paint and Play modules. • Delete jobs or scenes from the environment. • The Archive and Application categories are not user types. They are used for batch processing and other programs; do not assign them as user types. Unlock scenes locked by another user.